Are You a Blogger or Publisher? 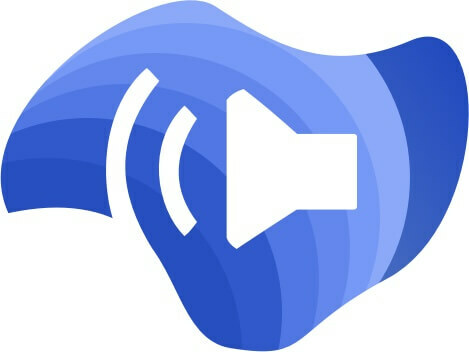 Turn all your website articles into high-quality audio in less than 5 minutes and for free. Does Your Website Have a Voice? In other words, do you have text-to-speech technology enabled on your site to read content out loud for your audience? With WebsiteVoice your audience can finally listen in to your content while being busy working, commuting, exercising, and having their eyes and hands full. Try WebsiteVoice now for free in 3 simple steps: sign up, install WebsiteVoice, and customize your audio voice for your site. So why WebsiteVoice? 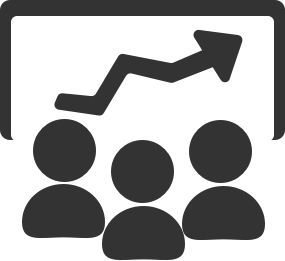 First, you can increase user engagement and time spent on your site by allowing your visitors to listen in to the content of your website in the background while they’re working, commuting, eating, or having their hands busy. Second, you can improve your website’s accessibility which is often times forgotten and to empower visitors who have visual impairment and reading disabilities to still completely consume your content without the complications of reading. Lastly, you can grow your subscribers and cast a wider net of audience who are more into listening to podcasts and audiobooks which nowadays is a very popular trend and growing behavior of people to consume content. 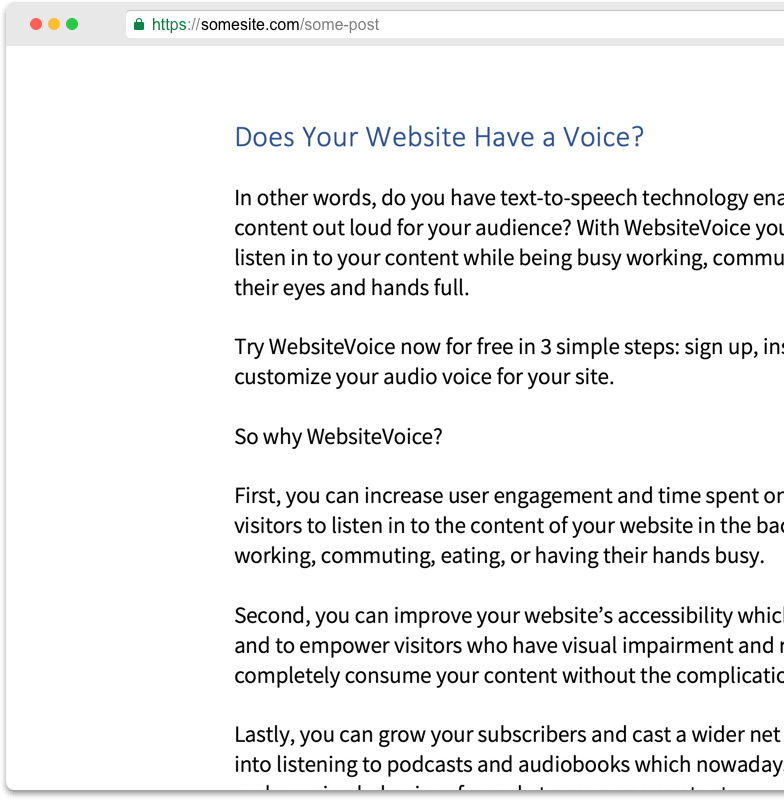 Are you ready to add voice to your website? Try WebsiteVoice now for free. Let your visitors listen to the content of your website in the background while they do other things with our text-to-speech technology and increase the time spent on your website. Accessibility is sometimes forgotten. 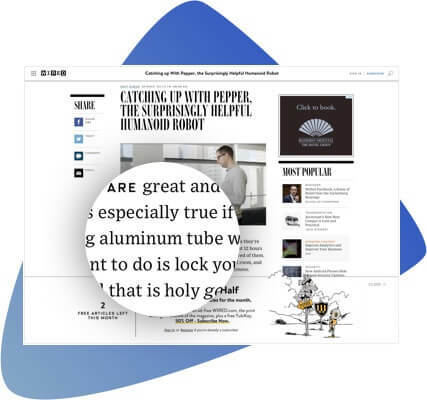 Empower visitors with visual impairment and reading disabilities to still completely consume your content without the complications of reading. Listening to podcasts and audiobooks has become a growing trend and behavior for people to consume content. Capture a wider audience that would prefer tuning in instead of reading. Ready to Add Voice to Your Website? Thanks to our Automatic Content Recognition technology, you can just drop our snippet on your site and forget about it. We will automatically enable text-to-speech voice for the relevant content. We use Artificial Intelligence and Machine Learning to constantly improve our voice algorithms to make your website text-to-speech as realistic as possible. Say goodbye to robotic voice, this is nothing like you ever heard before. Smart Adaptive Voice “SAV” will make your website sound like nothing you’ve ever heard before. 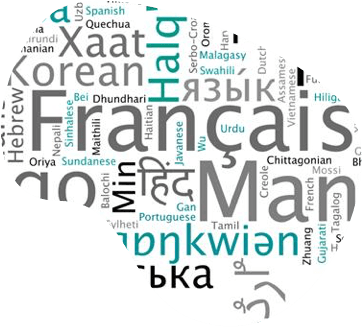 English, Chinese, Danish, Spanish, Dutch, French, German, Italian, Japanese, Korean, Norwegian, Polish, Portuguese, Romanian, Russian and much more, create a free account to see all. Gracias a WebsiteVoice, podrás añadir texto a voz a tu página web sin problemas y de forma fácil incluyendo diferentes idiomas y tipos de voces, masculíno y femeníno. Dank WebsiteVoice können Sie Text auf Ihrer Webseite ohne Probleme und auf einfache Weise mit verschiedenen Sprachen und Arten von Stimmen, männlich und weiblich, hinzufügen. 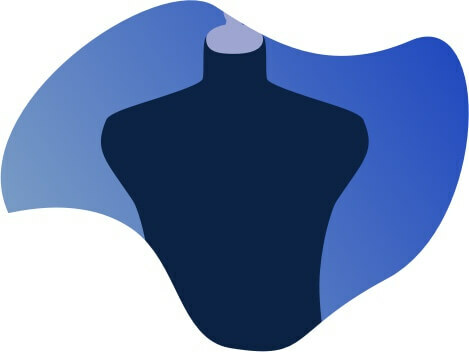 Grâce à WebsiteVoice, vous serez en mesure d'ajouter du texte à la parole sur votre page Web sans problèmes et de manière simple, y compris les différentes langues et types de voix, masculins et féminins. 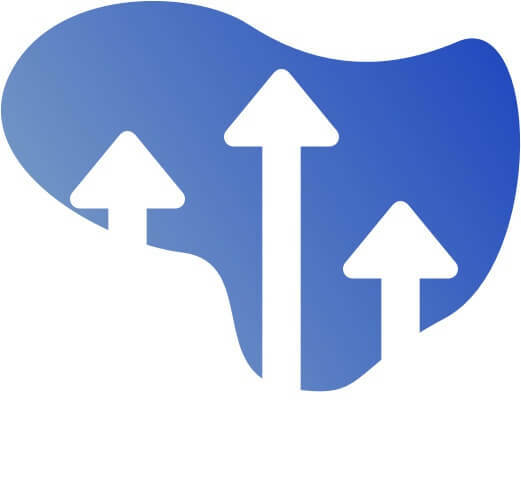 Use our advanced speed and pitch controls to modulate and change the voice of your website and match your desired effect to perfectly match your visitors and retention metrics. Universal Voice Tailor "UVT" has been created to match exactly the tone and speed you desire. Add the script on your site and customize the player widget to match your site and brand. Once installed, all changes can be done from the WebsiteVoice control panel. We’re a group of avid readers and podcast listeners who realized that sometimes it’s difficult to read up on our favorite blogs, news media and articles online when we’re busy commuting, working, driving, doing chores, and having our eyes and hands busy. And so we asked ourselves: wouldn’t it be great if we can listen to these websites like a podcast, instead of reading? The next question also came up: how do people with learning disabilities and visual impairment are able to process information that are online in text? Thus we created WebsiteVoice. 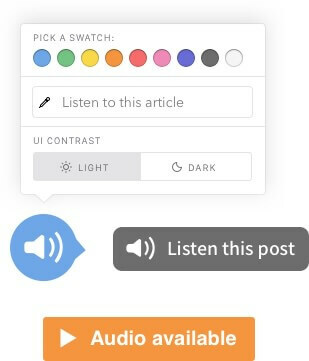 The text-to-speech solution for bloggers and web content creators to allow their audience to tune in to their content for better user engagement, accessibility and growing more subscribers for their website.